MEOWWWWW! Time for another letter to Santa. 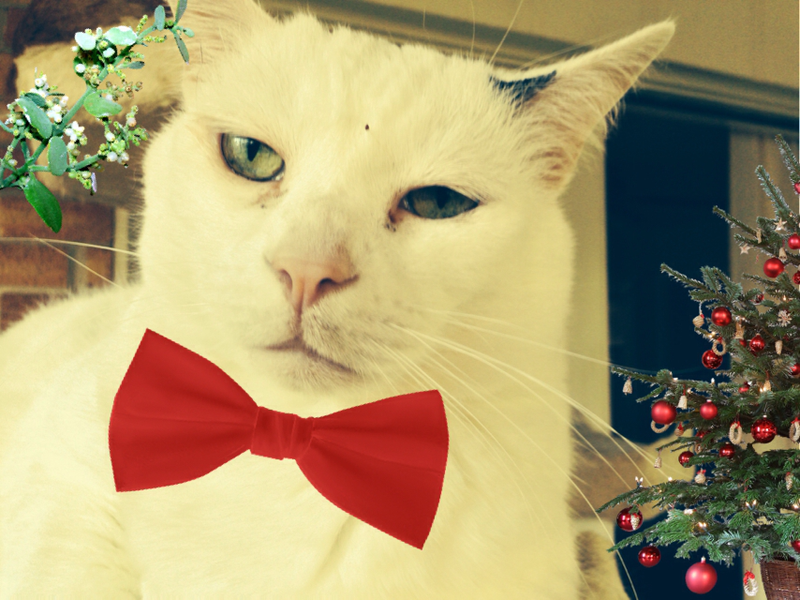 Today it is time for me, Sir Malachi, to share his holiday wishes. No pushing, ladies. There’s plenty of me to go around. I know you’re probably wondering what a cat such as I could possibly want for Christmas. Well, Santa, as ever, I am thinking of others. And what do others want most of all? A pawtographed 8×10 color photo of Yours Truly, of course. So here’s the deal. You supply the photos and the postage. I’ll pawtograph them and mail them to the ladies. Doesn’t that sound reasonable? Or, if that’s too technologically advanced for your elves, I completely understand. In which case, some of those delicious cheesy treats will suffice. Much love to you and the Missus, and tell that sweet little Vixen that I’ll see her next year. « DeDe: Enjoy the Moment! You do have a way with the ladies you gorgeous Sir Malachi! Move over James Bond in that handsome red tie! I hope Santa delivers the goods – and please pass on all our love to DeDe. Hey Sir Malachi, you are GORGEOUS! Cute as a button – and a real flirt! 😉 Well… with your good looks AND that perfect red tie it’s only natural that the ladies are crazy for you… We hope you’ll get a lot of chances to make them happy! 😀 Hope your wishes come true (especially the one involving delicious cheese treats 😉 )! My fellow kitties, Cheesie treats are quite good. I will have to invite you over for some. Malachi you are the man all ladies will ove! Great! WOW, that’s a great idea for wooing the ladies! You are original pal! aw such an adorable letter! LOL I hope you get your cheesy treats at the very least! Although I would Love to see your Pawtograph on one of your stunning pics! MEOW! Perhaps I should invest in a printer and take matters into my own hand. What? No catnip? My kitties always want the nippers! I will hang your picture right next to my doggie bed. ….or I’d be happy to share the cheesy treats with you…..
Or you could do both! We lady cats here swoon over handsome mancats!